Granted you don’t have to go nuts and buy 6 pairs, although I must admit I own at least 4, each a different shade of blue and each a different fit. Speaking of fit, with the boyfriend style jean it is important that you find the right fit for you. Some styles that are more of a loose fit are not the most flattering and can make you feel sort of frumpy, so make sure you choose a style that best suits your body type as well as your taste. I promise you there is a pair for everybody, its truly a universal style of denim! 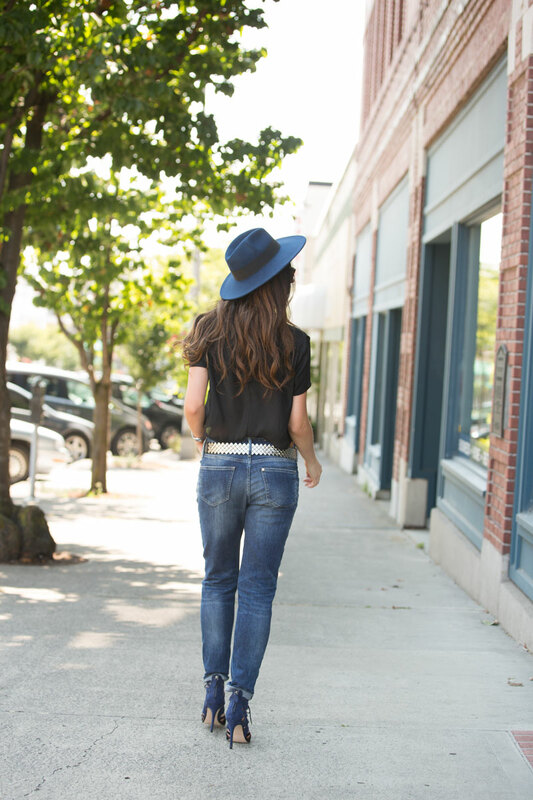 Here I styled one of my favorite pairs with a cropped boxy style blouse (if your comfortable with showing a little skin, it helps the look feel less frumpy when the jeans are a looser fit) I chose to dress the look up with a pair of heels, and added my navy hat that matched the denim to create a fun tonal effect. Adding a few details such as the silver metal belt helped give me that little bit of rocker chick vibe that I love! Oh and of course can’t forget the ray bans! Posted in Looks, Uncategorized.Tagged cropped top, denim, Echic, Evelina Taraylo, fall winter style, fashion, fashion photography, fashion styling, my look, my style, ootd, street style, trend.Bookmark the permalink.